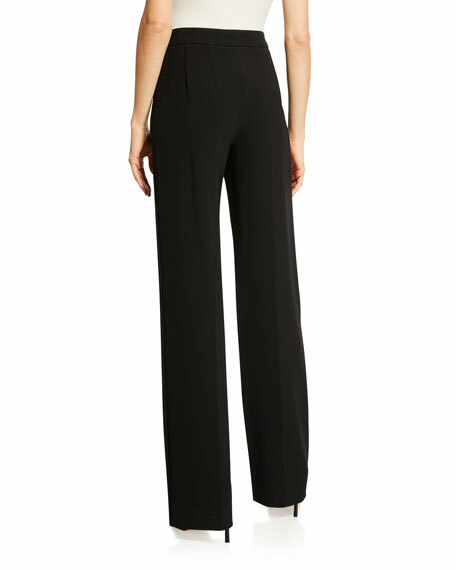 Stretch fabric pants by St. John Collection. Approx. measurements: 34.4" inseam, 44.1" outseam, 11.1" front rise, 18" leg opening. Akris punto "Ferry" jersey pants with stretch. Approx. measurements: 9" rise; 27" inseam; 38" outseam. High-waist; belt loops. Hook/zip front. Akris punto "Ferry" jersey pants with stretch. Approx. measurements: 9" rise; 27" inseam; 38" outseam. High-waist; belt loops. Hook/zip front. Side slash pockets; faux back pockets. Slim fit; straight legs. Cropped at ankles. Viscose/nylon/spandex. Lining, viscose. Dry clean. Imported of Italian materials. Bi-stretch crepe. Regular rise; yoked waist contours to your body. Flat front and back stay smooth under tops and tunics. 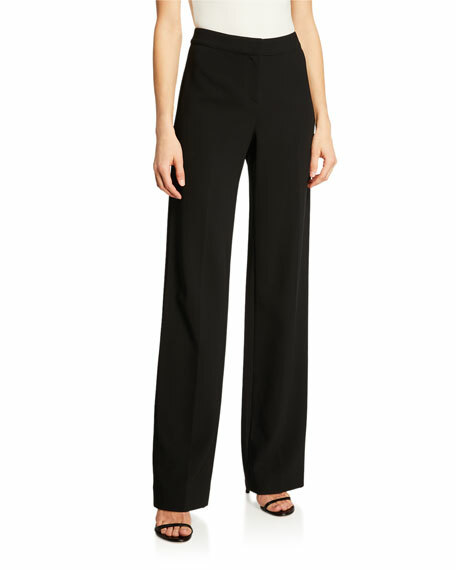 Elie Tahari "Marcia" crepe pants with matte stretch lining. Approx. measurements: 9" front rise; 29.5" inseam; 11" leg openings. Faux fly-front; flat waistband. Faux rear besom pockets. Fitted through straight legs. Ankle-length. Concealed side zip closure. Triacetate/polyester. Polyester lining. Dry clean. Imported.